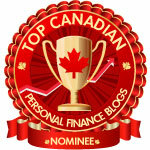 Canadian Financial DIY: Canada Pension Plan vs RRSP - Which is the better investment? 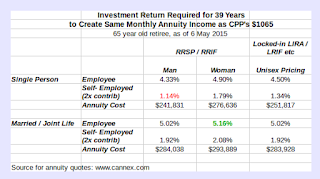 Canada Pension Plan vs RRSP - Which is the better investment? Not that we have any choice, since there is no way to opt out of the Canada Pension Plan, but suppose we could. Would it be better to invest in an RRSP? What kind of return would we need to achieve to beat the CPP? CPP: A 65 year old receiving maximum CPP of $1065 fully CPI inflation-indexed income per month for life would need to pay in for 39 years $2479.95 per year (in current 2015 dollars) if an employee, or double that ($4959.90) if self-employed and having to pay the employer portion as well. 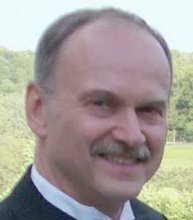 See RetireHappy blogger Jim Yih's explanation of how to get maximum CPP here. RRSP: The same $2479.95 (or $4959.90) is invested in an RRSP. At age 65, the person buys a $1065 per month lifetime annuity indexed (increased) annually by 2%, which is our best guess future rate of inflation based on the fact that 2% is the target policy rate of the Bank of Canada. Like CPP, the life annuity stops when the recipient, or the spouse as well in joint life annuity, dies. The prices we obtained from Cannex.com were for annuities with no guaranteed payment period. Buying an annuity that pays, either to you or to your estate, for a guaranteed 5, 10, 15, 20 or 25 years, will pay less than one with no guaranteed period. Compare the reductions in payouts for guarantees that rise with age and guarantee period at the Globe and Mail's annuity rate page. Single vs Married: The required RRSP return answer differs according to whether the investor is single, since the CPP has an automatic provision that a surviving spouse will get at least 60% of the contributor's CPP income level. But if the surviving spouse also contributed, he/she will get only as much of the dead person's 60% as will take him/her to the maximum of $1065. An annuity doesn't work that way. There's no cap and if a person is already receiving an annuity, it is not reduced or capped by a joint life annuity from the dead person. Instead of trying to directly figure out the comparative value of a single vs married person situation, I've just calculated both a single life annuity and a joint life with 60% continuation to the survivor spouse. Men vs Women: Men and women pay into the CPP at the same contribution rate and get the same monthly income payment too. But women live longer than men so they collect longer on average. Annuities bought with RRSP (or RRIF) funds recognize the differing life expectancies and so women have to pay more than men. This is NOT the case with annuities bought with LIF, LIRA, RPP, LRIF locked-in funds since the feds and most provinces long ago changed the law to mandate unisex pricing - a blend of men and women rates - see TransAmerica's table on page 5 of this pdf. The question is what compound return must the RRSP or the locked in RRSPs attain during the 39 years of savings and investment? Results - The results table below shows the return an investment portfolio would need in order to match the CPP's $1065 monthly income. Note that the table shows real returns since the required contributions are also indexed annually i.e. the maximum annual pensionable earnings figure, against which the 4.95% contribution rate is applied, rises each year by the amount of inflation, so each year the contribution stays the same in constant real dollars. Who gets the most out of the CPP i.e. 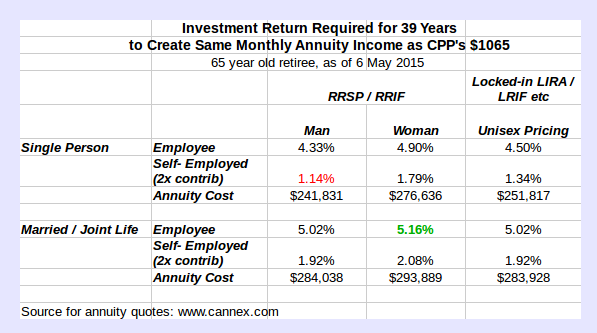 who would have had to get the highest investment return from their own RRSP portfolio to beat CPP? 1) Employees - because they contribute only 4.95% of their salary, while the employer pays the other obligatory 4.95% on their behalf. 2) Married people - since their spouse automatically continues to receive payment of 60% of the deceased's CPP whether the spouse has worked or not; in fact, the CPP deal is most favourable when the spouse has not worked and paid nothing at all into CPP. A married woman employee investing in a RRSP (who thus faces a more expensive longevity-based price for the annuity) benefits the most of anyone. She would have to beat a 5.16% annual compound return to outpace the CPP. A single self-employed man investing in an RRSP is at the opposite end. He might consider attaining a 1.14% annual return to be quite feasible. It is especially costly to be making the employer contribution as well as his own that makes the huge difference. Thus, for the majority of working people who are employees, it would be hard to beat a compound real return of 5% or so per year for the whole of an investing lifetime of 39 years. Compare a hypothetical portfolio using historical data for the 35 years from 1980 to 2014 on the Stingy Investor Asset Mixer tool. A portfolio of 50% each of the broad Canadian bond index (something like iShares' XBB) and the TSX equity Composite index (e.g. iShares' XIC) with all dividends reinvested and the portfolio religiously rebalanced once a year, costing ETF-like management expense ratios, would have produced a real compound return of 5.91%. The comparison doesn't quite match up since of course there were no ETFs back then and mutual fund fees were much higher, reducing investor returns. Second CPP contribution rates were much lower - too low - in the 1980s and 90s. Up to 1986 it was only 1.8%. The current 4.95% rate started only in 2003. Future likely / possible returns - The future probably won't be like the past. Returns are likely to be lower, as we have written about here and here. 4% or less real returns for mixed stock and bond portfolios are the probable ballpark, not close to 6%. The CPP is very competitive. Investor discipline and effort - Against the zero effort of the CPP, the chances that the investor will carry out the sustained annual rebalancing and reinvestment must be weighed. Inflation uncertainty - While the 2% indexing of the annuity is a best reasonable guess of future inflation, it does not remove the uncertainty about the actual future rate. Inflation might be lower, in which case the investor benefits from rising real income. Or inflation might be higher and the investor loses. A few years of 3,4,5% inflation, even if temporary, would significantly and permanently erode the value of the annuity. The protection against the possibility of inflation exceeding the currently expected rate is a big plus for the CPP. The question is whether the government would keep its promise to provide full indexing if inflation got really high. The promise is enshrined in law so not that easy to change, and the promise was kept during the high inflation 1970s but ... you never know for sure, things might be different in future. CPP disability benefits - Paying into CPP qualifies a person for more than retirement benefits. CPP provides substantial payments - a minimum of $453 up to $1212 per month - for those who have contributed but are no longer able to work. CPP children's benefit - Children of a CPP contributor can receive money from CPP two ways. 1) Children of someone receiving a disability benefit can also receive a benefit. 2) Children up to 25 can receive a survivor benefit if the CPP contributor dies. Perhaps we should not be surprised that polls find that Canadians love the CPP and want to expand it, as the Globe and Mail reported recently. CFP Financial Planning Ethics Commitment or Not? How safe is an annuity in Canada?